Ribbon: Half blue, half white. 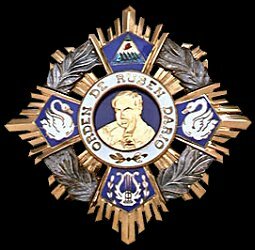 Awarded: For service to Nicaragua and to humanity in the fields of art, literature, science and international relations. 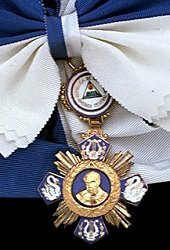 Grades: 7 (Collar, Grand Cross with Gold Star, Grand Cross with Silver Star, Grand Officer, Commander, Officer, Knight).